I did one Hatha class this week and I’m doing a Flow class this weekend, so I’ll be meeting my goal to do yoga twice a week. I actually noticed that my calves were tighter this week. The previous week I did more than two classes, and I’m thinking it’s probably correlated. I definitely don’t stretch enough on my own, and I love that yoga ensures that I have a thorough full body stretch at least a couple times a week. One of my favorite positions is the shoulder stand. It’s actually a position that I’ve randomly done my whole life. I often go into it while I’m playing with Teddy or stretching on the floor. I was so surprised when I found out it was a yoga pose! Who knew! If you are the type who has trouble to committing to yoga, I think getting an unlimited monthly pass is a pretty good motivator. As I was highly stressed this week because of a lack of sleep and having the house still all in boxes, it was tempting to just skip yoga and only do one class on the weekend. But I don’t want to waste my money! Gotta milk that unlimited pass for all it’s worth! If you’re doing the yoga challenge too, I’d love to know how your week went! Oh cake batter – how I love you! A cake is never made in my presence without a proper bowl licking. Raw eggs will not scare me away! 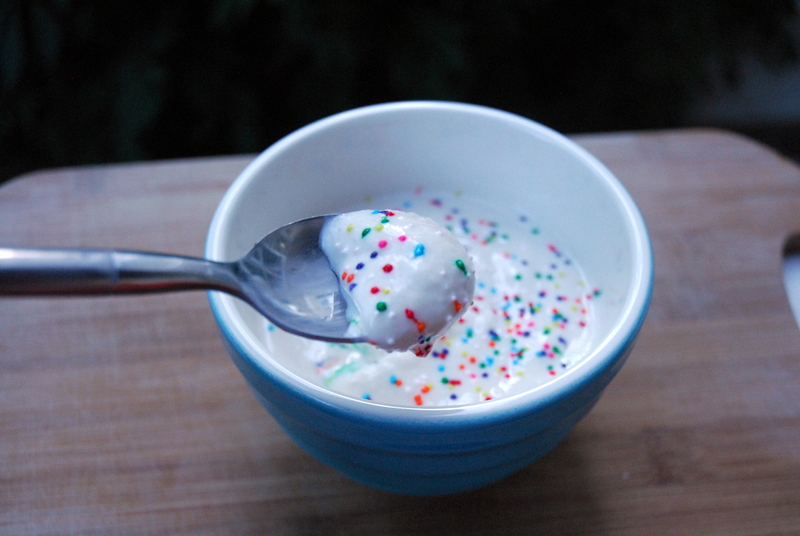 Cake batter and ice cream combined = a match made in heaven. I still remember the first time I had cake batter ice cream at Coldstone Creamery a few years ago. It was love at first bite. I think the cake batter flavor is either something you just love or hate. Luke isn’t a big fan, and I am madly in love. I love almost anything cake batter flavored. 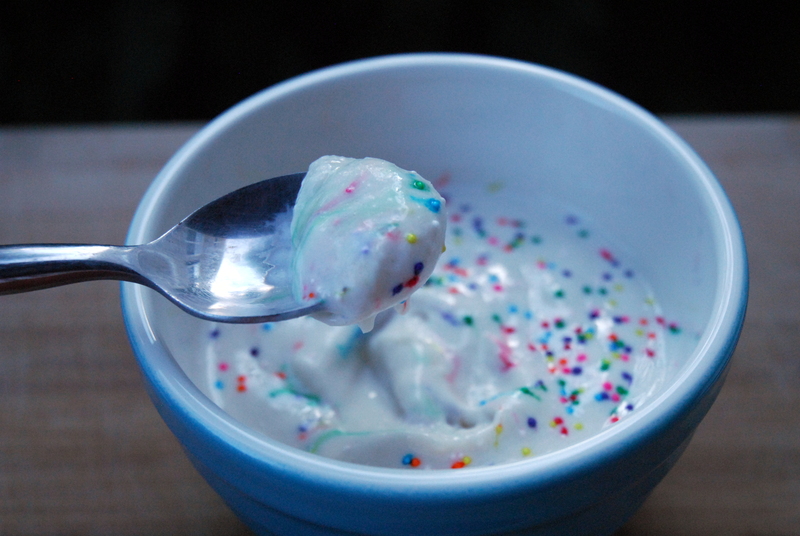 The other day I had one of my most genius ideas ever: Homemade Cake Batter Frozen Yogurt. SO GOOD. It has the soft and smooth texture of soft serve frozen yogurt and the sweet delicious taste of cake batter in every bite! I am still in awe that I can now enjoy my cake batter ice cream (well, frozen yogurt in this case) at home, any time I want. And it’s frozen yogurt, so it’s kind of good for you ;). 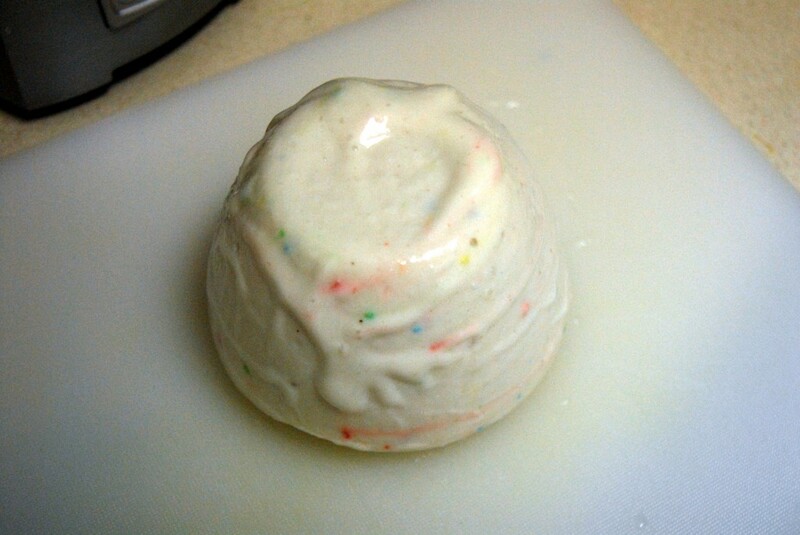 I made mine with funfetti cake mix because, clearly, funfetti is the best! If you’re a cake batter fan, please try this. It’s so easy to make – no ice cream machine required! 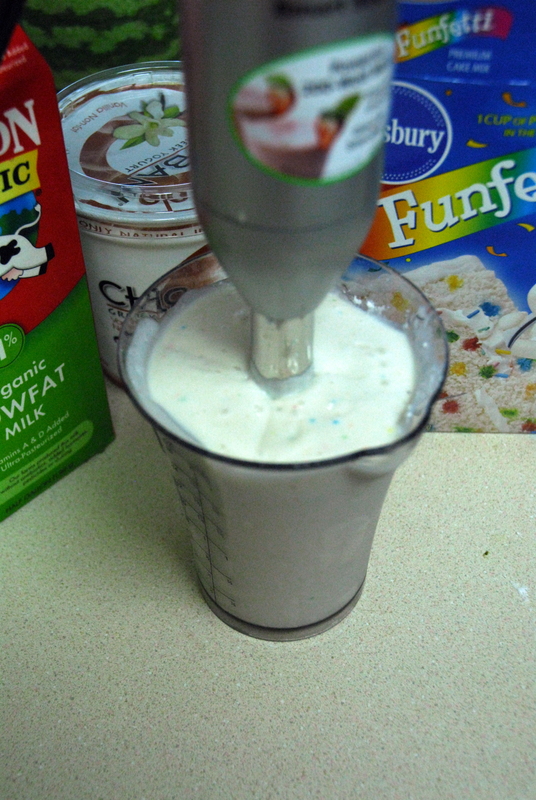 Just place all of the ingredients in a blender and blend until smooth. Transfer it into a bowl, cover and freeze for at least 5 hours. Remove the frozen mixture from the bowl (run hot water on the outside of bowl) and chop it up. Place it in your food processor and blend until smooth. Place all of the ingredients in a blender and blend until smooth. You can add more or less cake mix to taste, but I found that 6 tbsp was just the right amount. Pour the mixture into a bowl, cover, and freeze for at least 5 hours. When the mixture is frozen, run warm water over the back of the bowl so that it will come out of the bowl easily. Then chop up the frozen mixture into a few pieces so that it will fit in your food processor. 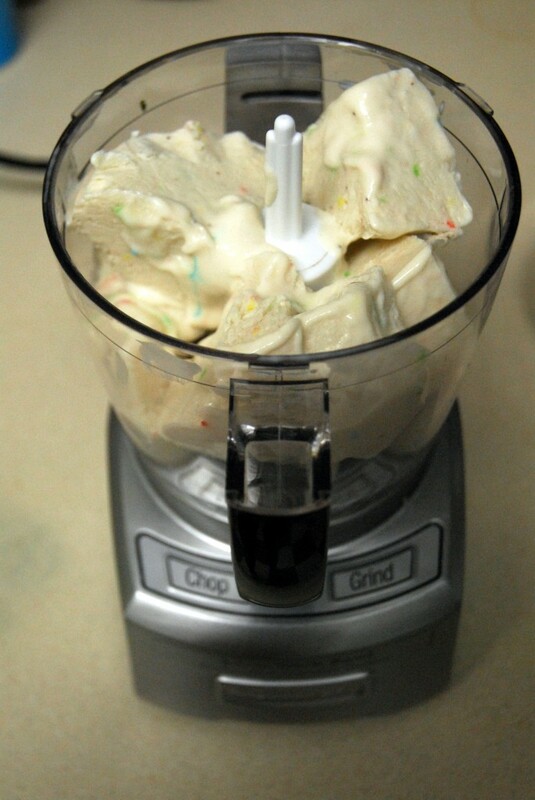 Transfer the frozen chunks to a food processor and blend until smooth. Top with sprinkles and eat immediately before it melts! *Note – the consistency of this frozen yogurt is like soft serve, not ice cream. This entry was posted in Dessert, Recipes, Snacks, Yoga and tagged cake batter, dessert, frozen yogurt, yoga. Bookmark the permalink. That is the best idea ever!!! I need to try that ASAP! Thanks! I hope you do – it is just too good! You have no idea how good this looks! I can’t wait to try it! It’s so funny when you find out a regular thing you do in life is actually a yoga pose. I stand in tree whenever I curl my hair (I actually picked that up from my mom, who did that every day when I was a little kid). I was laughing so hard when I realized it was a yoga pose! You just made my entire day with this post. GENIUS! That looks super yummy!!!!! Also, I wish I could do a shoulder stand. That’s pretty darn cool. What an awesome idea for the cake batter yogurt!!! I need to make it ASAP! Thanks! Hope you get a chance to make it and love it! A yoga challenge is a great idea, I’ms o glad you’re enjoying it. And WOW- the cake batter ice cream looks amazing! Thanks! I’m going to continue the challenge into July! OH MY GOODNESS how heavenly, wow you won me over with this. It’s unfortunate it isn’t GF. If you ever think of an alternative, let me know! That looks delicious and seems super easy! I was just saying that my neighborhood needed a froyo store, but I’ll definitely be making my own next week! We don’t have a froyo place nearby either, so this is a perfect solution! Girl you are a genius! Your cake batter fro-yo looks to die for! And so easy to! Nice job on your yoga challenge lady you are rockin it! Great job on the yoga front! I’m awful at stretching too and notice that I’m always tight… something to work on. Thanks! Yoga is definitely a good way to help ensure you get your stretches in! I love cake batter! And funfetti cake is my favorite! YUM! My kids(and who am I kidding, me too!!!) would love this!! I am going to make note of the ingredients and make it for a fun Summer treat soon!! Suzanne @ Fit Minded Mom recently posted..Voting is Open. Help Pick my Blog Header!! I hope you guys love it as much as I did! I cannot WAIT to try this recipe. 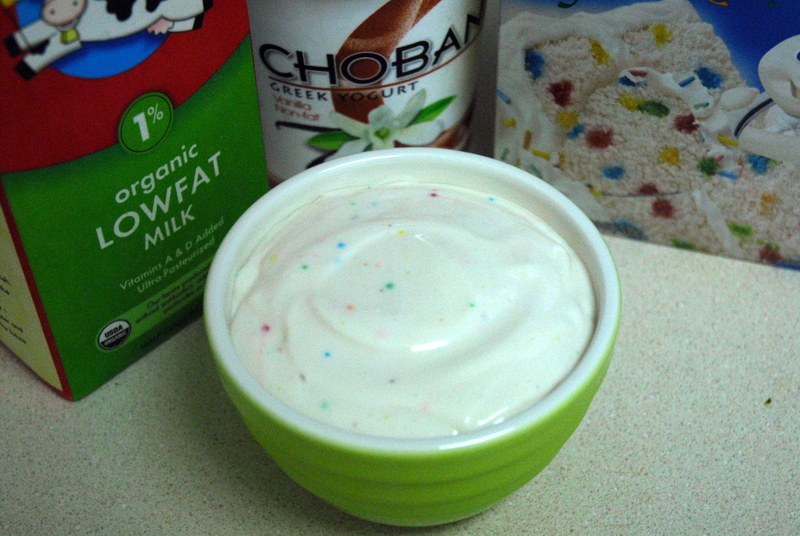 I just had some cake batter froyo from the store and I’d love to make my own, which is how I came upon your blog. Thanks for sharing the recipe! As far as the Yoga challenge goes, I hope you’re doing one in July as well.